Located in Costa Mesa, Camden Sea Palms is a boutique apartment community that offers luxury amenities inside one and two bedroom apartment homes with ocean views and a quiet neighborhood feel. Inside our apartment homes, you will find open floor plans, gourmet kitchens with black granite countertops, white shaker cabinets and wood plank flooring as well as central heating and air conditioning. 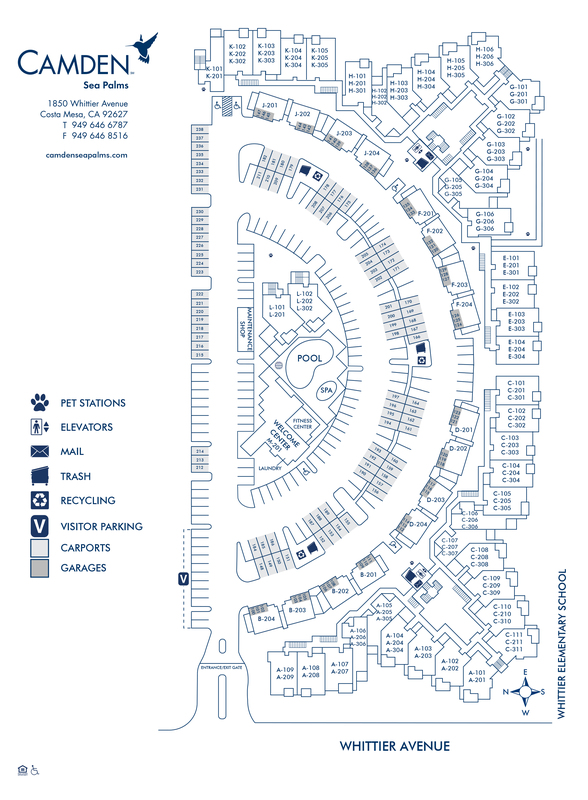 Each apartment home comes with two reserved parking spaces plus plenty of parking for your guests. And, our two bedroom apartments include washers and dryers. Camden Sea Palms offers an accent wall program so your new apartment home can perfectly match your style. Our residents enjoy lounging by the pool and spa, entertaining guests at the poolside BBQ, and staying fit with cardio equipment and weights in the fitness center. As a pet-friendly community, we provide an on-site pet butler, pet stations throughout the property and the chance to run and play nearby at the Huntington Dog Beach. Whether you feel like hiking, surfing, shopping or dining, access to the Pacific Coast Highway, 55, 73, 405 and Costa Mesa’s hotspots such as the Huntington Beach Pier are just a few minutes away. When you want to feel the ocean breeze and the sand between your toes, Newport Beach and Huntington Beach are just a short trip away. Walk to Triangle Square for dining and entertainment or head to South Coast Plaza, Costa Mesa golf course or the Orange County Fair Grounds - Camden Sea Palms is conveniently located close to it all! Extra perks from living at Camden Sea Palms include controlled-access into our small, gated community, 24-hour emergency maintenance, WiFi in common areas and a money-saving technology package. Bundled into the total monthly rent, this package includes high-speed internet and over 225 channels to choose from including HD channels and HBO. Our community also falls into highly-rated school districts and is close to many of Southern California’s best universities. Come home to Pacific Ocean breezes and the classic Southern California charm at Camden Sea Palms. Stop by today for a tour! Get the perfect spot! Each apartment home includes one assigned carport. We have ample open parking for our residents and a designated area for visitors on a first-come, first-served basis too.